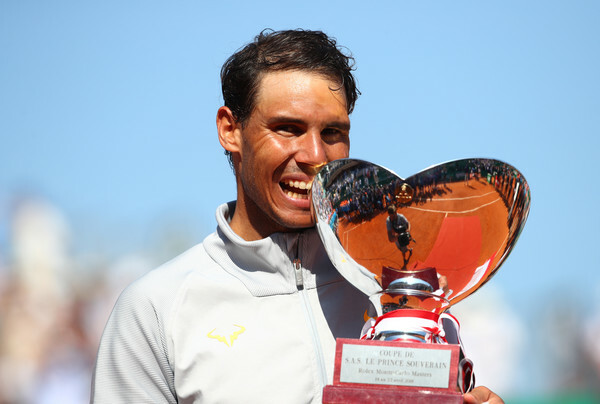 All ten sets won, only 21 games lost, and a record-breaking 11th title for Rafael Nadal in Monte Carlo after the Spaniard blew out Kei Nishikori in the final on Sunday. The Prince of Monaco may have been in the stands at the Monte Carlo Country club on Sunday, but the real royalty was on court at the Monte-Carlo Rolex Masters as world number one Rafael Nadal continued to re-write the record books with a dominant win to claim his record-breaking 31st Masters 1000 title and 11th in Monte Carlo. With Prince Albert II of Monaco looking on, the King of Clay capped off a dominant week of tennis by dismantling Kei Nishikori, overcoming a slow (by his standards) start to win 11 of the last 14 games in a 6-3, 6-2 blowout victory in the Monte Carlo final. In all four of his matches this year in Monte Carlo, the ten-time champion had broken in his first return game of the match. Nadal had an opening to go five-for-five when he pulled a ridiculously tightly-angled forehand passing shot to set up a break point. However, he narrowly missed his forehand up the line to send the game back to deuce. Nishikori would have to battle hard to snap Nadal’s streak, becoming this first person to hold his opening service game against the world number one in a ten minute and 57-second game. In a bizarre reversal of fortune, the Spaniard was the first to blink in the final. He double-faulted at 15-30 on his own serve in the next game to fall behind double break point. At the first time of asking, Nishikori chased down a drop shot and chipped a winner up the line to stun the Spaniard and take the early break lead. It would not last. 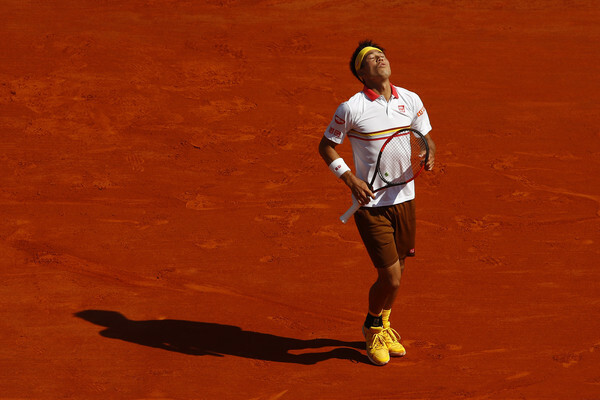 Being broken early rather than leading by a break served as a wake-up call to the King of Clay, who was vicious in his next return game, overpowering Nishikori who found himself down 15-40 when trying to consolidate the break. He would double fault on the second break point to level the set at 2-2. Nadal kept coming. In the Japanese’s next service game, the Spaniard set up another double break point with a backhand winner and Nishikori sent a forehand long to fall behind a break. The three-time Masters 1000 runner-up had a chance to break back in the following game when Nadal double-faulted at deuce, but he sent a backhand long. As Nadal looked to serve out the set, Nishikori mounted one last charge, saving a set point at 40-30 with a well-timed net attack to force a deuce. It would not be enough, as the Japanese sent his return long to give the Spaniard a second chance and the world number one made no mistake, unleashing a series of massive forehands, wrapping up the set 6-3 with a forehand winner down the line after 56 minutes. Once Nadal broke back in the opening set, Nishikori struggled to find any momentum as he was overwhelmed by the world number one. He nearly dug himself into an early hole when he dumped a backhand swinging volley into the net from the midcourt to give Nadal a break point in the opening game of the second set. Fortunately for Nishikori, the Spaniard sent his passing shot wide. But Nadal was relentless. In his next return game, the Spaniard reminded everyone why he has won this title ten times already, smacking back-to-back clean return winners from 15-30, the second of which only barely catching the line and needing a review that Nishikori disagreed with, to secure an early break in the second set. The King of Clay was rolling now, bludgeoning Nishikori into submission. The Japanese simply could not keep up, giving in to the Nadal onslaught with a series of errors. 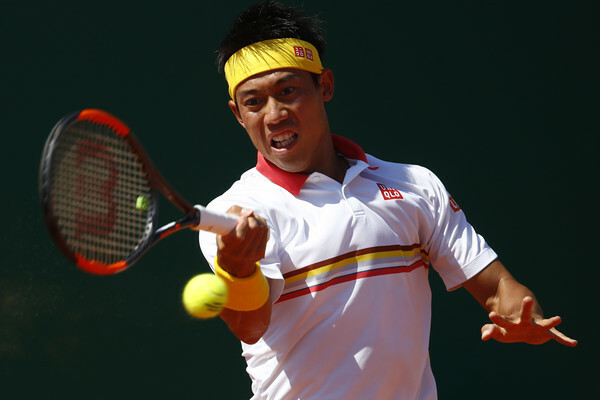 A game after being broken, Nishikori gave away the double break with an error-filled game. The Spaniard would hold for a 5-1 lead. The Japanese would not capitulate to Nadal, holding to force the Spaniard to serve out the title. But the most dominant clay court player in history was happy to oblige, holding to 15 to win his record-breaking 11th crown in Monte Carlo, wrapping up the match with a backhand winner. Nadal was better in pretty much every way, pummeling 20 winners, 13 off his forehand wing, going an impressive 12 for 17 at the net, and winning 74 percent of his first serve points. Nadal did commit two more unforced errors than Nishikori, 21 to 19, but the Japanese could only muster 12 winners. As if Nadal’s return of serve wasn’t tough enough, Nishikori did himself few favours by only putting 52 percent of his first serves in play. That was costly as Nadal took full advantage of second serves, winning 50 percent of those points. Nishikori, who was contesting his first final in over a year, falls to 0-4 in Masters 1000 finals and 11-12 in overall finals. The win is Nadal’s 11th at the Monte-Carlo Rolex Masters, the most by any man at a single tournament. 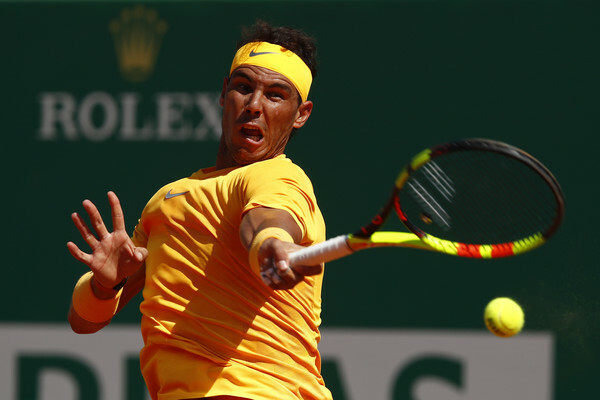 Nadal did not lose a set at the tournament, the fifth time he has won Monte Carlo without dropping a set. The Spaniard only lost 21 games in total in five matches, only once losing more than three in a set. He has won 36 straight sets on clay dating back to last season. The win is Nadal’s 76th title overall, moving him to within one title of tying John McEnroe for fourth on the all-time list. It is his record-extending 54th clay-court title. The title is Nadal’s 31st Masters 1000 title overall, breaking a tie with Novak Djokovic for the most Masters 1000 titles. The win also confirms that Nadal will remain at the top of the rankings for at least another week, which will give him 171 weeks overall, moving him into sole possession of sixth place on the all-time list ahead of John McEnroe.